The Porter Cable PC85TRSOK 8.5 Amp Orbital Reciprocating Tiger Saw comes ready to cut or rip through just about anything thanks to its ability to switch from reciprocating to full orbital action. Many tradesman might remember the original Tiger-Saw and know that it was a tool to be reckoned with. The big question for us now is if this new lightweight model can live up to its predecessors. Things like an adjustable shoe and a powerful motor are a good start for sure. At first glance this tool seems to be a great bargain because it is high on features and low on price, but before we can recommend this new breed of Tiger Saw, we have to spend a little quality time with it just to see how tame (or rather untamed) it is. The Tiger Saw came in a fitted rectangular cardboard box that had a cutout in the top so that it could be carried by the flip up handle on the hard case. Inside, the hard plastic case contained the TigerSaw, a 6-inch wood blade and instruction manual. The front half of the saw body is made of aluminum with the remainder out of a durable gray ABS plastic. A thick rubber boot covers the front half of the saw. We suspect this is for a few reasons. Like a cushioned grip, it protects the saw and also protects things from getting bumped too hard by the saw. The D-shaped rear handle has a generous amount of black rubber over-mold which also adds to the user’s comfort and grip. There are air vents in the plastic frame where it meets the aluminum front to help keep the 8.5 amp motor running cool. The large variable speed trigger allows the user to operate the trigger with two fingers. The variable speed allows for anywhere from 0 to 3,200 strokes per minute (SPM) with a 1-1/8″ stroke length. There is an adjustment knob that dials in an orbital or linear mode for controlling the stroke type on the top of the saw body. The orbital mode is excellent for demolition and fast cutting, while the linear reciprocating mode is best for cutting metal or finish cuts. A twist-lock blade clamp makes for speedy blade changes. The adjustable pivoting shoe is definitely a handy feature since it limits the cutting depth of the blade. However, we did have some trouble with it coming all the way out when adjusting it. We think that it would be easier to use if it had a stop that limited how far it came out. Another thing we liked about this tool was the power cord because it is made of a durable rubber material that doesn’t get stiff in cold weather. We just wish it was longer than six feet. The heavy-duty ABS plastic hard case is what really completes this kit because it protects the saw and it makes storing the tool easy. One of the first things we noticed about the Porter Cable PC85TRSOK 8.5 Amp Orbital Reciprocating Tiger Saw is that, for a orbital action saw, it is pretty light at 7.4 lbs. This definitely helps to make it feel well-balanced. The 1-1/8″ stroke with up to 3200 SPM and the orbital mode made for a winning combination when doing demolition work. We were surprised by how much felt vibration the rubber boot cover on the front of the saw cut down. Even though there is no built-in counter weight mechanism like some manufactures, we felt like we could use the saw for extended amounts of time without feeling fatigued. What really made the saw cut so quickly through walls, any kind of wood or somewhat soft materials was the orbital action. Orbital action causes the blade to dig down into the wood instead of merely going straight in and out. This action makes for fast chip clearing and quick cutting, especially when combined with a quality demolition blade. 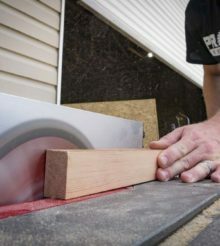 The pivoting, adjustable shoe let us use the saw at different angles and still have the shoe resting solidly on what we were cutting – a critical thing when using any reciprocating saw. The adjustable-depth shoe is a handy feature that made it easy to restrict the cutting depth. To adjust the shoe there is a red spring-loaded button that, when pressed, allows the shoe to be adjusted to one of the three cutting depths. The trick is that if you are not paying attention, and you don’t properly engage the shoe at the last position, it can simply fall off. Blade changes were fast and easy since all we had to do was give the twist-lock blade clamp a 1/4-turn to release the blade. When cutting metal or really hard materials we set the TigerSaw in the linear reciprocating mode, installed a metal cutting blade and then went to town. The saw made quick work of any kind of metal that we tried it on and demonstrated lots of power and speed. We chose the linear cutting mode when cutting metal because, unlike the orbital mode, it cuts with a straight pattern so the saw doesn’t jump or catch. This mode makes for an overall cleaner and smoother cut. Don’t let the 8.5 amp motor make you think for a moment that it is light on power. In our use of the saw, there was not an instance when it did not have adequate power to chew though whatever material we tested it on. The Porter Cable PC85TRSOK 8.5 Amp Orbital Reciprocating Tiger Saw is designed to cut through just about anything since it has a orbital and regular reciprocating modes. When set to orbital mode, it was ready to do some serious demolition work. All in all, this tool is a great bargain because the features far outweigh the almost unbelievably low $80 price tag which is why for our Value rating we gave the saw a well deserved 9/10. For our Performance Rating, we give this tool a 7/10 because it demonstrates more than adequate power and an orbital mode dial that is usually left for saws that cost nearly twice as much. From what we can tell, this reciprocating saw can wear the Tiger Saw name proudly since it lives up to the legacy of the original.